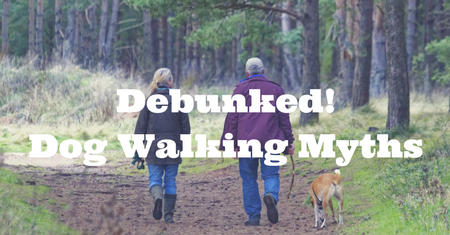 Myth #1: The dog should maintain heel position during the walk. Truth: For dogs, walks are primarily about sensory stimulation--not sustained walking. They're in it for the sniffing opportunities, so heeling the whole time is boring and frustrating. Myth #1b: Letting your dog walk ahead of you makes him Alpha. Myth #2: Harnesses teach dogs to pull. Truth: Harnesses do not teach pulling any more than collars teach pulling. The wrong kind of harness will make the pulling feel worse, but it doesn't *teach* the dog to pull. The right kind of harness is actually an integral part of teaching good leash manners. Myth #3: During walks, dogs should meet lots of other dogs for socialization. Truth: Good socialization doesn't require "meet and greets." It's far more important for your dog to be able to calmly pass another dog on the street than be able to play with all dogs. Playtime is optional. Passing on the street isn't. When your dog meets every dog he sees, he expects to meet every dog he sees. This usually results in dogs who lunge and vocalize in their frenzy to greet Every. Single. Dog. Truth: Nope. They actually leave me feeling #Sad. The modern on-leash "pack walk" often involves suppression via pain and fear to keep the dogs in line, and doesn't provide any scenting opportunities. "My Dog's Not Treat Motivated"